There was hoping this new system would not be affected by it, but the first email scam has found its way to the new Facebook Messages system. 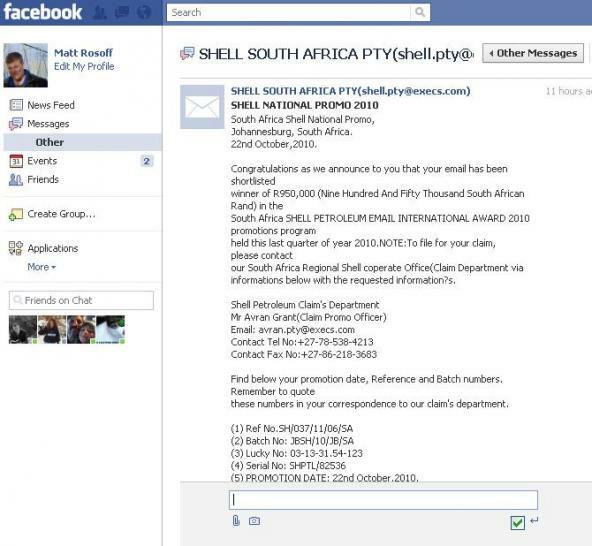 Business Insider’s Matt Rosoff notes that he received a South African promo scam message, just three days after he got his Facebook email account. That’s bad marketing already for a system that’s only in its infancy, still. Facebook didn’t just give the keys to new and budding page admins with a slick new tool, it just handed the keys over to every opportunist and spammer in the world. In our testing, keep in mind, Trendline has 18 total fans. There are no apparent limitations on who can use this functionality. Somewhere, a Nigerian prince is thankful that his job just got easier. I agree with Morgan, and as Matt notes in his post on Business Insider, people on Facebook are not expecting this, compared to their Hotmail and GMail accounts. So users beware of these scams popping up on your freshly activated Facebook Messages accounts! I think people may be running away with themselves here. The new feature on Facebook does not allow you to send mesages at all. Just an invite. This doesn’t appear as a message it appears as an invite, in the “requests” section (game notifications etc) of your FB profile. If you have a facebook page and have 50,000 fans you have for quite some time been able to send a message to all 50,000 of them (or segment and target your pages fans). 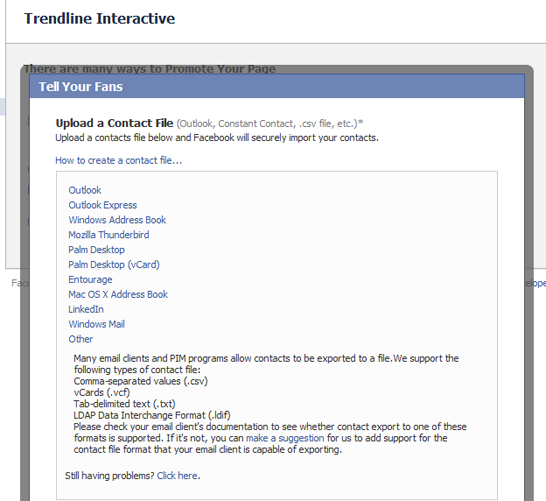 The new feature allows you to import your email address list, if there are users on that list who are NOT on already fans of your page, and they are members of facebook the invite will appear in their profile in the “requests” section as a page recommendation. If they already like your page they will not get the recommendation, if they are not on facebook they will not get an email. I know I have tested it, I have more than one client currently using the feature. So what would you use it for? You have launched a facebook page and you want to promote it to your organisation/site membership then this is one channel available to you. Even with responsive subscribers, the uptake on these recomendations tends to be slow and small. Thanks for this bit of clarification Andrew. I combined these two things in this post because they’re both about Facebook Messages and about the spam issue: but if the import option only allows invites for FB pages, that’s fine. On the first issue: I’ll try to figure out how it’s possible that he got spammed on such short notice – like I said on Twitter, it seems he’s been either sloppy or this is done on purpose to put down Facebook Messages upfront. The above is hearsay, until I see an account myself Im not positive about the whitelist… but I believe it to be true. I think the big thing here is that people do not appreciate clicking “like” gives the owner of that page the ability to send you a message anytime they like. You dont need an FB email account either, just a normal FB account (which you obviously have to be able to ‘like’ in the first place). Apologies Remy I made a mistake.